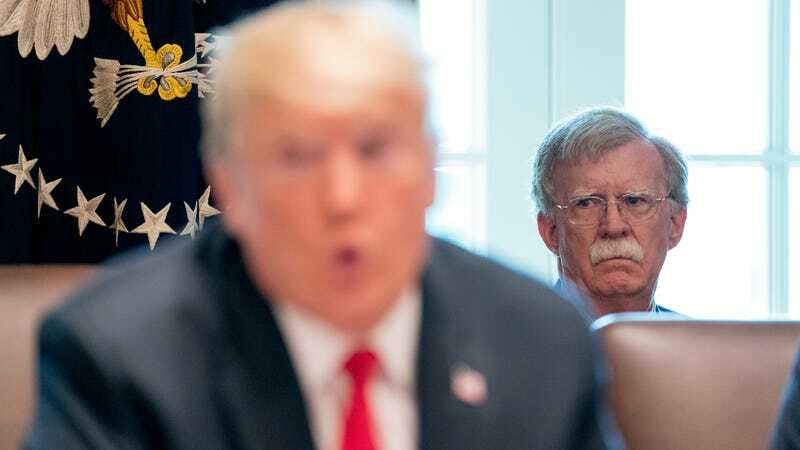 National security adviser John Bolton listens as President Donald Trump speaks during a cabinet meeting in the Cabinet Room of the White House, Thursday, Aug. 16, 2018, in Washington. With the launch of a new national cyber strategy, President Donald Trump has authorized the increased use of “offensive cyber operations” against U.S. adversaries, National Security Adviser John Bolton told reporters on Thursday. Trump’s strategy, which he calls the “first fully articulated cyber strategy in 15 years,” replaces one implemented under the Obama administration. It is said to considerably relax rules surrounding the use of cyberweapons by the Pentagon and other agencies. The U.S. government has long developed cyberweapons—viruses and other tools used to surveil and sabotage the systems of foreign nations, such as China and Iran. “We’re going to do a lot of things offensively,” Bolton said. The move comes as U.S. intelligence warns of ongoing foreign operations aimed at undermining the 2018 midterm elections, including cyberattacks against voting infrastructure and computer intrusions targeting election officials. Asked if he considered the U.S. to be actively involved in a “cyberwar,” Bolton said he didn’t accept that “characterization.” But with its hands no longer tied, he said, expect the U.S. to strike back more frequently.